VADODARA: Eighteen persons were killed and 114 injured when the Ahmedabad-bound Sabarmati Express from Varanasi rammed a stationary goods train at the Samalaya railway station, 26 km from Vadodara, early on Thursday. Dr. S.B. Saxena, medical superintendent of the Vadodara SSG hospital, where most of the deceased and injured were brought confirmed 15 deaths. He said that at least 20 persons were critically injured. The Railway Minister, Lalu Prasad, who reached the site by noon, was heckled by Sangh Parivar activists, who staged demonstrations and raised slogans against him when he visited the SSG hospital in Vadodara. Some demonstrators threw stones and smashed his car. The enraged Railway Minister held the Gujarat Chief Minister, Narendra Modi, responsible for the demonstrations and demanded his immediate sacking by the Centre. The Western Railways General Manager, M.Z. Ansari, attributed the accident to "human error" and ruled out sabotage. He said the signalman of the Samalaya `B’ cabin had apparently disengaged the automatic inter-locking system by pulling the lever but could not re-link the track. This wrongly put the Sabarmati Express on track four on which the goods train was standing. The signalman, J. Singh, and his assistant were absconding, he said. 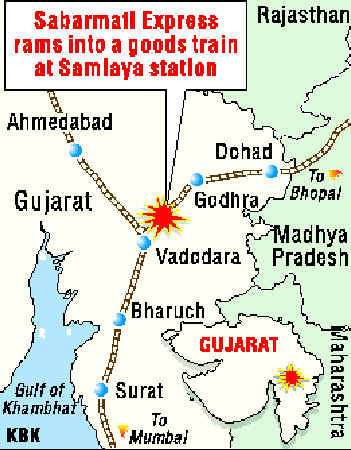 The train, which left Godhra around 2.30 a.m., was running at 100 kmph to reach Vadodara at 3.45 a.m. when it rammed the goods train at 3.13 a.m. just as it was to pass through the Samalaya station. It was not clear why the signalman had tampered with the automatic locking system but railway sources said the train was to make an unscheduled halt at Piplod, two stations away from Samalaya, to allow the Rajdhani Express from Mumbai to Delhi to overtake it. The driver of the Sabarmati Express, Rai Singh, and his assistant, Kishan Lal, who had taken over at the Ratlam junction, were killed on the spot. However, the guard of the stationary goods train, who was in his cabin when the passenger train rammed it managed to jump out of the cabin and escaped with some injuries. The first seven coaches of the Sabarmati Express were the worst affected. 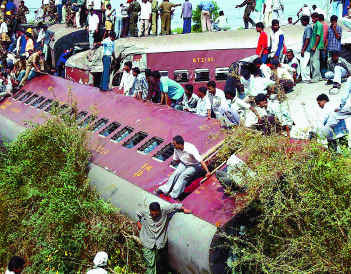 The railway police sources said that most of the deceased were the passengers in the first coach. Two other coaches piled up on to the engine under the impact of the collision. The loud noise woke up the local villagers who rushed to the spot and tried to rescue those trapped and provide relief to the injured. Bhailalbhai Prajapati, an elderly resident of Samalaya, said he reached the spot within minutes after the accident and found people running helter-skelter crying for water. The local youth swung into action and rescued many of the injured but there was not much of transport to rush them to Vadodara. The darkness at the accident site hampered the rescue and relief operations. Rescue operations started only after daybreak, a full three hours after the accident. 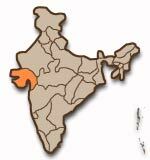 Railway rescue and relief trains were rushed from Godhra, Vadodara and Ahmedabad. The State Government also dispatched fire brigades from Rajkot and the three nearby major centres to assist the railway rescue team. Two companies of the State reserve police were sent to maintain law and order and keep the thousands of curious onlookers at bay. Railway traffic was restored within hours as the main track was not affected. By late evening, the mangled coaches were removed from the site. Mr. Modi, who reached the site by 9 a.m., stationed four members of his Cabinet, including the Minister of State for Home, Amit Shah, at Samalaya to co-ordinate the relief and rescue operations. Ashok Bhatt, Kaushik Patel and I.K. Jadeja were asked to oversee the relief work and co-ordinate with the Government Hospital in Vadodara and the railway authorities. The railways have asked the Commissioner of Railway Safety to inquire into the cause of the accident. Mr. Ansari said the inquiry would begin by April 23 and was likely to be completed in three days.